News Article just released in the Santa Fe New Mexican press: click here! Ross takes on Taos Mountain Casino Marketing Director Position! Read the latest News Release from Taos New Mexico ... Click Here! "Ross Anderson has been number 2 in the World Pro division and in 2005 he earned him the Bronze medal in Cervinia, Italy at the World Championships World Cup skiing. He has held the National champion title for the last five years in a row, and announced today his new goal for 2008 is to break the World Speed Skiing record. Lofty? Yes. Attainable? Definitely." Ross has been awarded as the 6 X National Champion and made the top ten ranking for the World Cup 2008 season. Just thought everyone would like to see a video piece recently uploaded on You Tube from the 2008 Subaru Velocity Challenge. Be sure to catch him in Albuquerque, New Mexico this weekend where he will be signing official SAY MAG postcards ... as part of the NMX sports winter show. 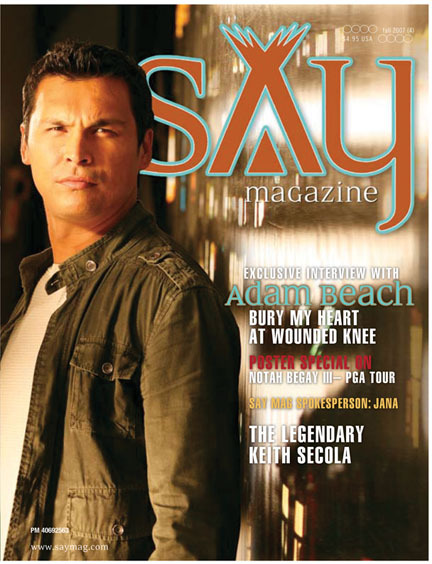 Say Magazine, a nationally-based magazine, has published a full spread on Ross Anderson in the Fall 2007 issue. Click Here to read the entire article! The old adage, "Find a need and fulfill it," was once again successfully borne out in Vincent Schilling's new book, Native Athletes in Action. It consists of 13 chapters dealing specifically with Native Americans/Native Canadians who have risen to the top of their sport, through courage, talent, determination and sacrifice. Although 13 different people are covered in the book, more than that number of distinct sports are included - Jim Thorpe (of Sac and Fox heritage) participated in baseball, football, lacrosse and track and field (Summer Olympics, 1912). Many will find the entire publication to be truly inspirational. Native Athletes in Action is aimed at sixth-grade readers and up but the courage of the athletes contained therein should be compelling to one and all. Enriching accounts of such people as Cheri Becerra (Omaha), a paraplegic since the age of four, competing in the paralympics and winning medals in the three-wheeled wheelchair is truly heartwarming. Or perhaps the chapter on Naomi Campbell (Karuk), first female Native American to appear in the winter Olympics (2002), will give you encouragement. Mescalero/Ruidoso residents, however, will find chapter 10 of interest as lo-cal luminary, Ross Anderson (Cheyenne/Arapaho and Mescalero), is prominently featured in an eight-page section concerning his sport - speedskiing. "Ross definitely had to be included in the book as his sport, speedskiing, epiti-mizes the courageous nature of Native Americans," explained Schilling. "Having the audacity to ski down a mountain at speeds approaching 150 mph is somewhat extreme. Besides that, he has a real cool uniform and neat equipment," he humorously added. This is the first book Anderson has appeared in and, needless to say, he's quite excited about it. "I'm very honored to be included with such illustrious Native Americans as Thorpe, Becerra, Cory Witherill (Navajo) and all the others," Anderson proudly said. "I met Cheri Becerra back in 2000, at the Native American Sports Council in Colorado. She's a real credit to her tribe as well as being an inspiration to all people of handicap. She's a courageous individual." Anderson, No. 2 in 2001 in the FSSV the Pro Mondial and No. 8 in FIS World Cup this year is very happy to get the exposure for the sport of speedskiing - as are all of his competitors in FIS and PRO. "What helps one of us, helps the entire sport of speedskiing," Anderson maintains. Schilling (Mohawk) spent a year and a half researching Native Athletes in Action before he sat down to write it. His publisher, Books Publishing Company, had been looking for a Native American author to write just such a nonfiction work and a chance meeting between the two worked out to the benefit of both. This book is a testament to Native Americans and all who choose to be the very best they can be in their preferred sport. It showcases the necessary discipline and fortitude required to continue on in the face of adverse odds, and gives meaning to the phrase, "the loneliness of a long distance runner." This work is the first in a series of books to be written by Schilling, and he has already begun his next project, which is titled, Men of Courage. Native Americans in Action may be purchased through Booksamillion.com, Borders and Amazon.com for $9.95. Native Americans across the country have yet another reason to stand tall, Ross Anderson, professional speed skier. Ross is a proud resident of Ruidoso, New Mexico and the Marketing Manager for Ski Apache, a ski resort owned and operated by the Mescalero Apache tribe. Ross has been known as the World’s Fastest Native American on Mother Earth for years but on April 19th, 2006 he set a new record at 154.06 mph (247.93KPH) and is now known as the Fastest Skier In North American History. Returns home #2 in the world! Professional Speed Skier, Ross Anderson ­ The Fastest American Indian on Mother Earth, will arrive Wednesday into Albuquerque International Sunport after 10 weeks on the 2001 European Speed Skiing Tour. Anderson, A 28 year old (Cheyenne/Arapaho, Mescalaro Apache) from Durango, Colorado will return with the best results to date in international speed skiing competition, keeping the talented Team USA at the top of the rankings and meeting his goals of the 2001 season. Anderson¹s top ten performances were just the tip of the iceberg for his personal best race performance and his 2001 goals, but he took it a step further. Finishing #2 in the Championnat Du Mond Ski Vitesse World Championships in Les Arcs, France April 15th, 2001. Thus by far being the first American Indian to stand on an international World Championship podium in any skiing event in the world to date. Anderson again in March, was amongst the top ten, finishing #9 in the Federation International Ski World Championships ­ in Cervinia, Italy just one week before being crowned #2 in the world. This season has been the most productive for the 28 year old, who besides making himself as a regular in the top ten standings and on the podium, made himself accessible by his improved website (www.rossanderson.org). Ross¹s race results and performances could be seen this season on www.rossanderson.org, that was regularly updated with the latest race results, digital still photos of Ross in preparation for competition and QuickTime clips of his race runs. "This hopefully will allow all my sponsors and fans a chance to be part of the tourS" says Anderson. "SSeeing a run over 100mph on skis is way different from doing 100 mph on skis, but I believe the viewer gets a better idea of what type of athlete and mind set you must be in to do what I do". Anderson¹s accessibility on the internet has not only helped more people to understand what speed skiing is, but has also given more people an understanding who Ross Anderson is. As an American Indian athlete, he sees it as an opportunity for young people to have goals and dreams, and accomplish them just as he is doing now. This is one of the goals with his American Indian kids ski program held every February at Durango Mountain Resort in Durango Colorado. Ross Anderson and Team Warrior will be returning to the United States from Europe Wednesday, May 2, 2001. Ross Anderson¹s current personnel best is 220kph / 137.86 mph. The world record is currently held by Harry Egger (AUT) at a speed of 248kph/ 154.00 mph.